The IFTA winning feature documentary ‘Waveriders’ is set to receive its television premiere on Monday, May 10th on BBC NI. The documentary tells the story of how an Irishman, George Freeth, is credited with making the sport of surfing the success it is today. Surfing is one of the fastest growing sports on the island of Ireland but many people’s perception of it is its association with sun, sea, sand and California. However, it’s a widely held view that George Freeth, whose father left Ireland in the late 1870s, played a pivotal role in popularising it. Freeth is credited with re-introducing the ancient Polynesian art of wave riding in Hawaii at the start of the 20th century. ‘Waveriders’, follows some of the world’s top surfers back to George Freeth’s ancestral home providing viewers with footage of them tackling 60ft monster waves off the west coast of Ireland - the biggest waves ever surfed there. 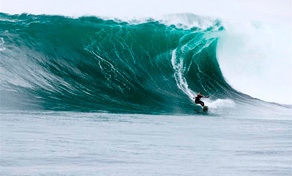 Filmed in Hawaii, California, Northern Ireland and the Republic of Ireland, ‘Waveriders’ features a distinguished cast including top professional surfers Richard Fitzgerald, Alastair Mennie, Gabriel Davies, nine-time world champion Kelly Slater, Irish and UK surf champion Easkey Britton and famed surf writer Kevin Naughton. Made by Inís Films and Besom Productions, ‘Waveriders’ was awarded the George Morrison Feature Documentary Award at IFTA 2009. It is written by Lauren Davies (Commitment) and Joel Conroy (Eye of the Storm) who also directed and produced by Margo Harkin (The Hunger Strike). The film was financed by Bord Scannán na hÉireann/ The Irish Film Board, Northern Ireland Screen, the European Union through the Interreg IIIA Programme managed for the Special EU Programmes Body by the ICBAN Partnership, BBC Northern Ireland and the Broadcasting Commission of Ireland. ‘Waveriders' will receive its television premiere on BBC 1 NI at 10.35pm on Monday, May 10th.